ADT Motorcycle Training offers training for all categories of motorcycle license including direct access, restricted licenses, and further training. Most of our training is conducted in set courses of 4-6 days, with your tests on the final day. Individual lessons are also available for those who wish to take things a little slower, please contact us for more info on these lessons. Please make sure you have passed, or booked your motorcycle theory test before booking your course with ADT. This license is available for anybody 19 years of age, or over. In order to obtain this license with ADT, you will take your test on one of our 500cc machines. Providing you pass the tests at the end of the course, you will then be given a license which will allow you to ride any motorcycle up to a maximum of 46.6 bhp. There are many models of bikes which fall under this power limit, and any bikes which do not may be restricted to this power by a motorcycle dealer. For advice on which bikes you can ride and where to restrict them, speak to our knowledgeable team. Click here to contact us. This option is for anybody 24 or over. It is also available to those who have held an A2 license for at least 2 years. In order to gain this license with ADT, you will take your tests on a 650cc machine. Providing you pass the test at the end of the course, you will then be given a license which is unrestricted, and allows you to ride any size machine. Depending on the length of your course,you will begin your course on either a 125cc machine, or a 500cc, and will progress onto a 650cc machine when your instructor decides you are ready. There are also other categories of license, see the notes at the bottom of the page. The 4-day course is our most popular option. This course is designed for those riders who already have a reasonable amount of experience in riding a motorcycle with gears. An example of a 4-day course candidate would be somebody who has previously completed a CBT, and has been riding a 125 regularly for some time. This course would also suit somebody who has some considerable off-road experience, especially on bikes over 125cc. The 5-day course is suited to somebody with only basic experience in riding a geared motorcycle. This course would be recommended to somebody who has only recently completed a CBT. If you've had a successful ride on a friend's bike, or ridden years ago, this course may suit you also. The 6-day course is designed for those who are completely new to motorcycling. Starting with a CBT on a 125, the course will progress onto a 500cc motorcycle when your instructor feels you are ready, and then onto a 650 respectively (where relevant). Why choose ADT for your course? ADT have been conducting training for tests for over 20 years, our experience has ensured a continually high pass rate. We will teach you to ride safely, not just to pass your test. Unlike other schools we will teach you how to look at any given situation and decide how best to deal with it, rather than riding robotically and treating every junction and hazard in the same way. Have a look at our feedback on facebook to see the kind of reactions our customers have. This test can be taken by anybody aged 16 or over. You will take your tests on a moped (50cc). Providing you pass, you will be given a license which will allow you to ride any vehicle up to 50cc, providing it has a maximum speed of 28mph. 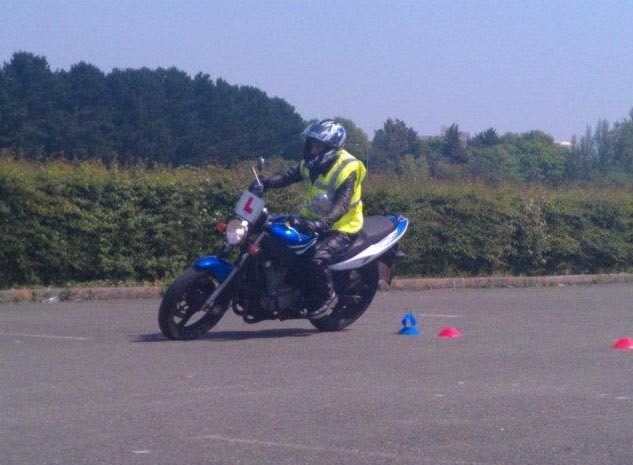 This is our least popular course, as a CBT will allow you to ride a vehicle up to 50cc, and up to 32mph (category p). An AM license however will allow you to ride a moped without L-plates, and will allow you to take a passenger. This test can be taken by anybody aged 17 or over. You will take your tests on a 125cc machine. Providing you pass, you will then be given a license which will allow you only to ride up to 125cc with a maximum power of 14.6bhp. Although this license doesn't allow you to ride anything bigger than a CBT will, it does last for the life of your license, you may use motorways, ride without L-plates, and take a passenger. All of the categories of full licenses detailed on this page can be taken on automatic bikes. If you pass your tests on an automatic machine, you will be resticted to an automatic machine until you take any further tests. This restriction is in conjunction with any other restrictions placed on you license category. Please call us on 02380 337351 if you'd like some more advice on the type of training you require.